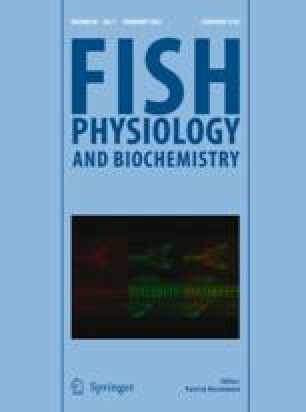 The fatty acid compositions of wild female northern pike (Esox lucius L.) and their principle prey species were compared to assess the extent to which pike modify the relative abundance of dietary fatty acids during assimilation and to indicate the optimum dietary content of essential fatty acids (EFAs) for pike. Only minor differences existed between the estimated whole body fatty acid composition of pike and diet fatty acid composition as calculated from the contribution of each prey species to the pike's diet. Saturated fatty acids comprised a slightly higher percentage of diet lipids (25% wt) than of pike lipids (21% wt) whereas monounsaturated fatty acids were less abundant in diet lipids (26% wt) than in pike (29% wt). Percentages of total polyunsaturated fatty acids (PUFAs), n - 3 fatty acids, and n - 6 fatty acids were approximately 43, 30, and 13% wt respectively and differed by less than 1% wt between pike and diet lipids. Among individual PUFAs, the largest differences occurred in 20:5 (n-3) and 22:6(n-3) which comprised, on average, 9.6 and 14.7% wt respectively of diet lipids and 5.9 and 18.3% wt respectively of pike lipids. The close similarity in fatty acid composition between pike and their diet suggests that pike may have limited abilities to elongate and desaturate 18 carbon PUFAs and may require specific long chain PUFAs in the diet. The n-3 PUFA content of the pike's natural diet may exceed the minimum EFA requirements of better studied species such as rainbow trout and turbot.